Select classrooms are also open to families using their local school system for half or full day kindergarten. 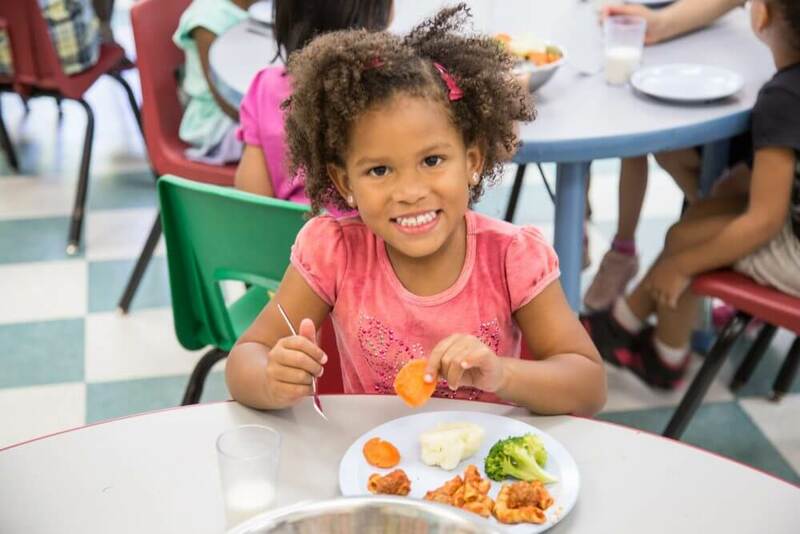 Our kinder care programs compliment the curriculum offered in nearby schools and include fresh and nutritious menus from the Kidco Kitchen, flexible hours, and transportation provided at no additional cost. This option is perfect for families who are ready to enter into the school system but need a high-quality partner who can work with the school’s schedule in providing care and a safe environment for students to continue their development. Kinder care programs also provide full-day care for off-school days like professional development (PD) and summers. Our kindergarten program focuses on early literacy, numeracy, science skills, music, French, the arts, drama and play. The curriculum is designed to foster a love of learning and the ability to ask questions, seek out answers and build self-confidence. We also include nutritional education and wellness in our program, which compliments the healthy, delicious food in our Kidco Kitchen menus. Many parents worry about large kindergarten class sizes in their local school. The Kids & Company kindergarten program aims for an 8:1 child to teacher ratio and always follows provincial standards to ensure children receive individualized attention and the support needed to maximize their learning potential. Children learn best when their environment is geared to their interests. While every student in our program will gain the skills needed to succeed in Grade 1, we are not limited by a mandated curriculum. Our small class sizes and our staff trained in adaptive early education or emergent curriculum allow us to tailor each student’s learning experience to his or her individual interests and developmental levels. The result is a structured atmosphere that encourages and creates self-guided learning – students want to learn because they love what they are doing. We recognize how stressful it can be to have one child in child care and another in the school system. For families who have a kindergarten age child and a younger sibling, using our kindergarten programs allows for one drop off and pick up location. It also allows kindergartners to remain in full day care with children their own age and with age-appropriate learning. As part of our kindergarten program, all of our students have lunch and snacks provided by our Kidco Kitchen. The menus are created by a nutritionist, cooked by chefs and approved by kids. Meals are served family style, with students and teachers sitting and eating at the table together. Our food program extends beyond the lunch table. We focus on teaching children where food comes from and the basic knowledge of food groups, vitamins and minerals. See our menus and read more about why our parents LOVE the Kidco Kitchen. The Kids & Company Montessori Enriched kindergarten program is available at select locations and is a wonderful alternative for parents interested in full-time care and the Montessori method of learning. Montessori encourages your child’s natural curiosity and provides a sense of accomplishment by helping them make choices and continue the learning curve to reach their personal goals. Key elements of this program include practical life, sensory, math, language and culture. Children participating in the Montessori Enriched kindergarten program benefit from a full day of enriched learning opportunities, while parents benefit from having their child’s kindergarten and child care in one convenient location. For more information on our kindergarten and Montessori programs, please contact Kristine at kgrant@kidsandcompany.com or 1-866-MY-KIDCO (695-4326).